High performance TV tuner for your PC or laptop. 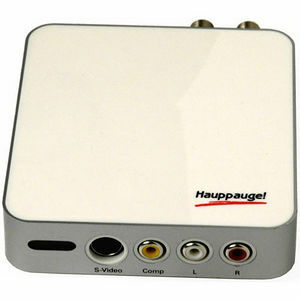 Watch, pause and record analog cable TV and HDTV channels, at up to 1080i resolution. Watch Analog TV by connecting to Cable TV. Watch Clear QAM digital cable TV, or ATSC over-the-air digital TV. View in full screen or in a window. Remote control and IR blaster included. Record analog or digital TV shows to your computer's hard drive with one click. Digital TV programs are recorded in their original video quality. 1080i programs are recorded at 1080i, etc. The built-in hardware MPEG-2 encoder is used when recording analog video. Record analog cable TV or video from S-video or composite sources using MPEG-2. Use WinTV-Scheduler as a personal video recorder to record your TV shows daily, weekly, or only once. NTSC is the analog cable TV standard for North America. ATSC is the over-the-air digital HDTV standard for North America and typically requires an antenna for reception. Clear QAM digital cable allows users to watch unencrypted HDTV stations from their cable TV provider without a set-top box. Analog TV recordings typically consume 1.5GB of disk space per hour. High Definition TV recordings typically consume 5GB of disk space per hour.